Esthechoc, known as the “Cambridge Beauty Chocolate” claims it is the first anti-aging chocolate bar in the world, sounds to good to be true! Since we couldn’t find any honest reviews about Esthechoc on the web, we have decided to review this “magic-chocolate”. In your dreams everything is possible, but I have never dreamed about a chocolate bar that will let your wrinkles disappear. It would be my favorite beauty food! A couple of months ago I wrote an article about the benefits of Dark Chocolate for your skin, which made it to the top 10 list of best anti-aging foods! As I wrote earlier; Dark chocolate helps to reduce stress because it contains cocoa. Cocoa helps reduce stress hormones, which means less collagen breakdown in the skin and eventually fewer wrinkles. The packaging is beautiful! Opening the little flat bars you immediately smell the fresh-cocoa-smell. Wow! One esthechoc bar contains 38 kcal, but they are very small, so it’s no different comparing to normal dark chocolate. The percentage of cocoa is over 70%. Not bad, it’s comparable with Lindt dark chocolate, which is a huge compliment for Esthechoc. 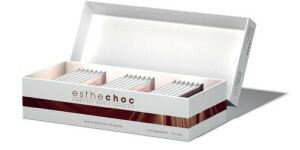 The price of Esthechoc is ridiculous, it’s $56,- for one box. But is Esthechoc any different comparing with normal dark chocolate? Conclusion: It’s just overpriced dark chocolate, we wouldn’t buy it again. Have spent over £150 and have taken Esthechoc for 12 weeks now and can see no difference at all in my skin. My advice to anyone thinking of trying it?……DON’T! Don’t waste your money. Does not fulfill its promises in the slightest. In fact my sister thinks I’m looking older and she doesn’t even know I’ve been eating this stuff!!!! ESTHECHOC IS A BIG SCAM, DON’T BUY IT. I FEEL ROBBED! THANK YOU BEST ANTI-AGING FOR TELLING THE TRUTH! Beautiful box, agreeable flavour, but had no effect. I have very thin skin and decided that I would give Esthechoc a three month trial. Although it is very expensive, it would be worth it if it would help my skin. But at the end of three months, disappointingly there was no difference whatsoever.